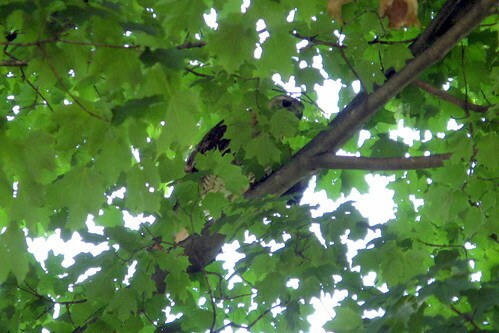 hawk in the front yard, originally uploaded by jahansell. This isn't a great photo - nothing like the bird pictures my colleague, Abraham Lincoln (really) takes over at Brookville (OH) Daily Photo. But it was a cool moment - this bird fell out of the sky into the tree (it seemed to have something in its talons and a bunch of small birds were chasing it). It dropped down onto the front walk for a few moment - a red tailed hawk on the sidewalk! -- but by the time my quick-footed children appeared with the camera it was back in the tree. Tomorrow is worldwide City Daily Photo theme day - stand by for a fascinating tour around the world!